Full electric cars might be starting to take the spotlight, but hybrids remain the volume choices. We try the latest two to market. NOT every brand is willing to jump into the wholly electric vehicle game – some big names would prefer to stay one step back, in the hybrid zone. While full electrics are going to increasingly feature in our motoring future, for the here and now in respect to volume penetration and market proliferation hybrid vehicles which allow just a touch of full electric driving but primarily use battery assist to enhance their fossil-fuelled performance are the big hitters. Need you be reminded that king of that crowd is Toyota? Didn’t think so. The Japanese No.1 started this market with its first-generation Prius. Two decades on, it has implemented petrol-electric tech across almost all its passenger cars and made it part of the normal, daily driving lives and routines world-over. This is no half-measure push. It has so far sold more than 11.4 million electric-assisted vehicles – which represents a reduction of more than 90 million tons of CO2 - and demand remains high. Last year’s global tally of 1.52 million was a record annual count for the brand, not just an eight percent lift n the 2016 result but also an achievement it had not expected to tick off until 2020. Where Toyota goes, some others have followed. The latest being Kia, with the Niro, an early step – since followed by a more ambitious plug-in hybrid version – in a big push on more ecologically friendly vehicles, occurring in tandem with even greater efforts from sister brand Hyundai. Together are planning to launch dozens of fuel-sipping or all-electric cars between now and 2020. So, today, we look at that starter model Niro and also the latest generation of a Toyota New Zealand (and taxi rank) stalwart, the Camry Hybrid. Best Camry, worst time. If you’re looking for an instant gratification synopsis, that’s pretty much it. 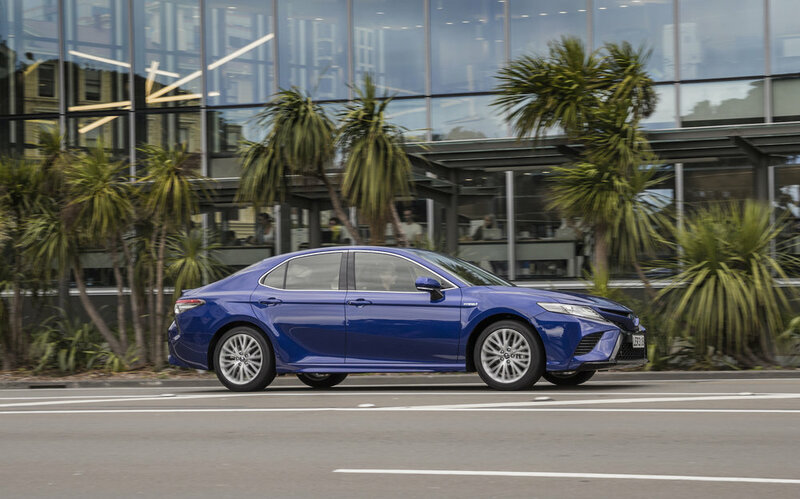 Contention from Toyota NZ over the past year has always been that extra-special status could be accorded this latest generation, restored to production out of Japan now that the Australian assembly line is closed and designed foremost for American market requirement. With driving time in the $49,470 ZR Hybrid now clocked, I can affirm they’re not spinning a PR line. In so many ways, this car sets a new standard for the type. Just a shame the best Camry has landed in the worst market condition; with medium sedans accounting for just three percent of the new vehicle market. Will that worry Toyota? It holds one ace in the hand. Ownership of the fleet market sustains this car to the point where it will sail on as king of the heap. Albeit a very diminished heap, a relatively modest volume, but still ... On the other hand, Toyota NZ latterly keeps saying it wants to build up its private penetration. I’ve no doubt the ZR Hybrid could achieve there, but arguably the fleet association is so strong as to almost keep it from being considered. So, realistically, the best chance of gaining acquaintance might be as it has previously been; as a taxi passenger or operator. Still a good way to admire what Toyota has achieved, all the same. The technical side of past versions has always been a strong drawcard and assuredly nothing will change. 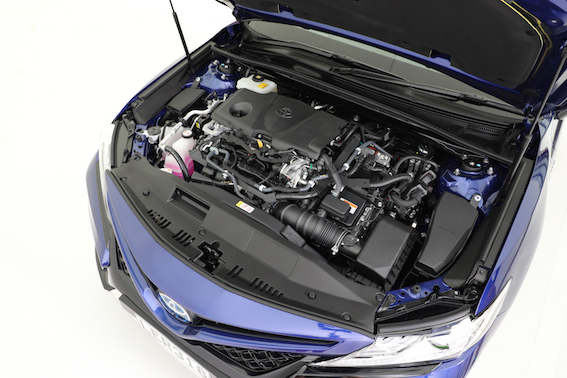 That 2.5-litre four-cylinder petrol/electric motor hybrid set-up, with 131kW power at 5700rpm (160kW combined) and torque of 221Nm at 3600rpm, running a CVT and able to optimally deliver, though perhaps only in a Japanese test lab, an economy of just 4.2 litres per 100km is a big point for efficient operability. All the same, there’s every chance the primary attraction this time might come as result of it having considerably strengthened in areas that Toyota previously did not give as much attention to. The styling, clearly, is a more obvious draw. The conservatism that pinned back the previous generations has gone. It’s a smart-looking machine, not just in adopting more modern and devilishly rakish bodywork but also in its lowered, more hunkered stance. Even greater appeal associates with the interior. Again, a total rework and immediately striking as the bigger improvement, in that while materials are undoubtedly as hard-wearing as before – and, let’s face it, a high degree of durability is no bad thing, particularly when this car is in a commercial role but even when undertaking family duty - it simply smacks as being far more premium; almost Lexus-like in some respects. As such it presents a quantum leap over previous executions, which though always well-constructed were not of the same quality and feel, let alone anywhere near as flairful in presentation. Again, like the exterior treatment, it’s a factor that will elevate owner pride. That’s not to say there isn’t some stuff they couldn’t have done better. 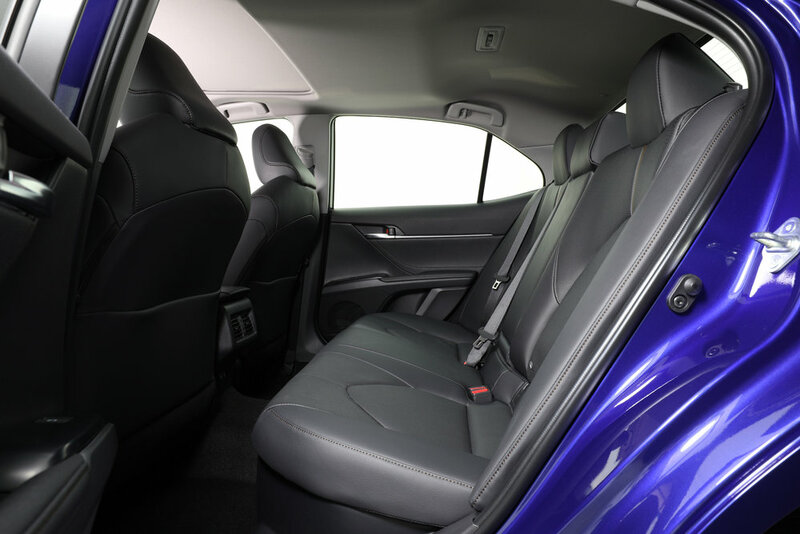 Primarily, the front seats, though said to be of improved design, are not as comfortable as they appear to be; poor grip in either the side or base erodes figure-hugging potential. The driving position overall, though, is solid, with a steering wheel provisioning reach and height adjustment and generous seat adjustment allowing for every conceivable positioning taste. Also, as much as the infotainment system is a step ahead of the previous car’s system in look, it really doesn’t offer any greater benefit and feels a generation old in most operational respects. Establishing the Bluetooth phone link is less awkward but audio streaming via Bluetooth is less logical nor does it seem to operate seamlessly. Adopting Apple CarPlay and Android Auto would resolve that issue, and also provide a smarter sat nav operability (because, as before, Toyota’s sissy operational logic demands that you must be stopped to implement any kind of input). Except, of course, Toyota daftly still prefers to cold-shoulder those implementations. Below the infotainment screen are the dual-zone climate controls. Are the temperature controls entirely accurate? It would seem unlikely for Toyota to mess this up, yet the air coming out felt colder than the set temperature suggests. Camry-ites will be impressed that, at long last, the campaign to rid the car of its horrible foot-operated parking brake has paid off. Now there’s an electric handbrake, a much tidier and more welcoming provision. At the very base of the dashboard is a small cubby hole which is the wireless phone charging pad at this level. A greater count of USB and 12v outlets is also welcoming. Though slightly shallow, the boot is well-dimensioned overall and, in offering 524 litres of storage space, large enough to take a full complement of luggage. There are several reasons why it is so large. First, the model doesn’t carry a full-sized spare tyre. Second, and more importantly, the hydrid drivetrain’s battery has been moved from its boot-space robbing position to under the seats. 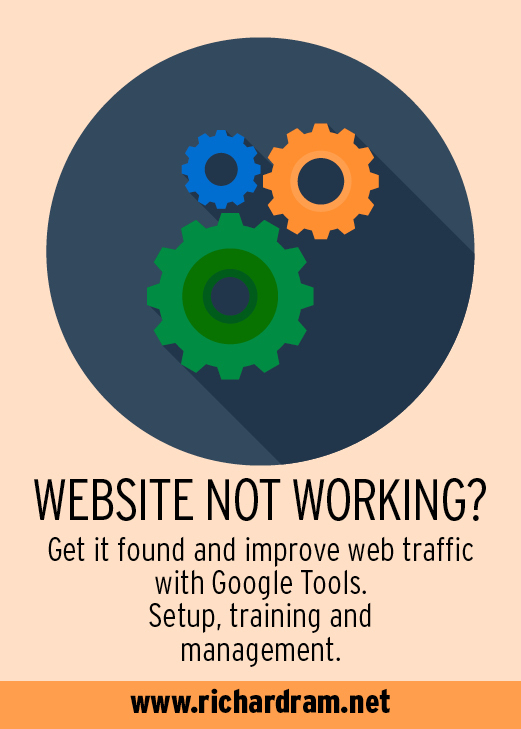 Again, you can understand why a certain buyer group will be particularly happy about this. The even greater benefits of TNGA is that it delivers a stronger, safer cell and improved dynamics, in part through it provisioning a lower centre of gravity. 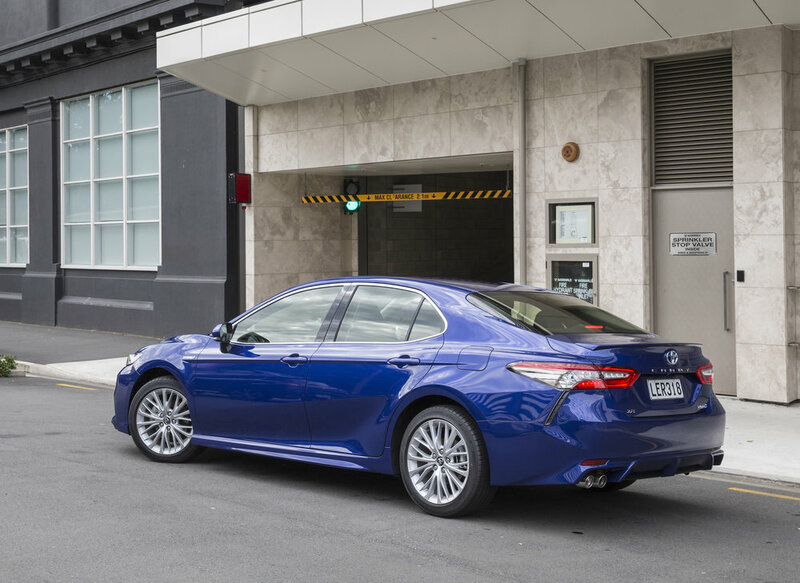 In respect to the latter, it’s obvious this Camry is a particularly smooth (and quieter) performer now, to the point where it will happily stand comparison with Lexus product in respect to its overall refinement. If you enjoy a car that will simply exorcise significant road, drivetrain and wind noise from the driving equation when cruising at 100kmh, then this is definitely a short-list choice. So it gives. Does it also take away? In respect to handling characteristics, there is a clear change. The Camry when delivered via Australia benefitted from significant local market refinement, primarily to make it more of a driver’s car. I’m not saying the replacement doesn’t also achieve in similar vein, yet in returning to an original factory formula in respect to suspension tune (and tyre choice), what we get now is ultimately presenting an altered state in respect to its incisiveness. It just feels more relaxed and less inclined to be hurried. Pushing on elevates impression that there’s more softness to the ride, body control and steering than we once had. It’s not bad, yet it’s less enjoyable. Grip and balance are fine, but there’s a degree of disconnect. Who drives a Hybrid that way? Well, fair point. Most people will never think to, yet fact is that the drivetrain is lusty enough to allow it, though in giving it beans you will of course be at cost of efficiency. In respect that, you might wonder if Toyota has relaxed its attitude, given there are now four drive modes and one of them is labelled Sport. However, the latter setting doesn’t make the Camry any faster, it just raises the revs allowing you to access the meat of the torque a little quicker and to hear a little more of the engine note. The EV and Eco modes, on the other hand, are patently more seriously attuned to delivering Green goodness. As before, the EV setting is a little disingenuous in that it doesn’t allow the Camry to operate as a fully electric car at anything more than very slow speed and, even then, for a modest duration. Eco is as handy in that it provides a coasting function, a bit like selecting neutral, for when you come off the throttle. The implementation of this feature adds weight to Toyota’s thought that, just because an increasing count of full electrics is arriving, this doesn’t mean hybrids are becoming yesterday’s tech. 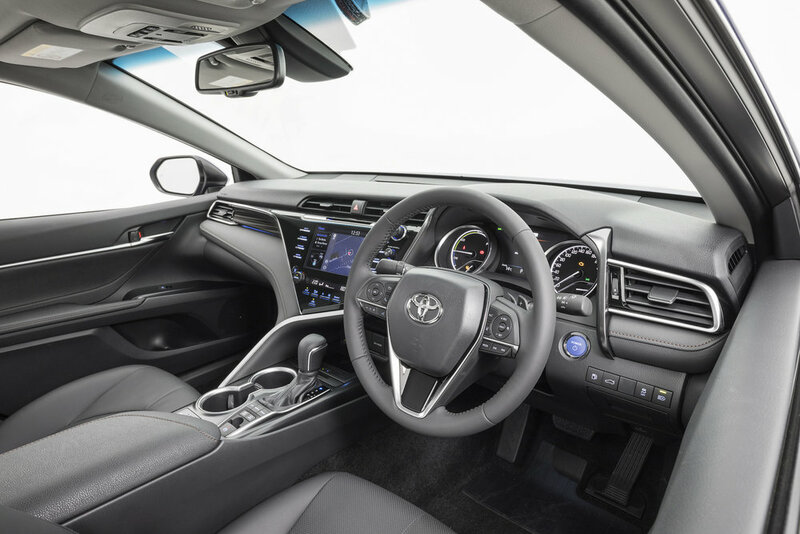 Clearly the Camry is staying very much on message given the entire drivetrain – the petrol engine, electric motor, power control unit, transaxle, and battery - are all new. According to Toyota, this hybrid set-up has seen energy loss reduced by 20 percent while power and torque is up 11 percent and four percent, respectively with peak torque arriving 900rpm earlier. You can enter into different sub-menus that detail what and how well the drivetrain is doing; the graphics are better now but you still feel that only those with science degrees and who wear white lab coats to work will have greatest understanding. One thing about the car’s eco-minded operability that might annoy: The brakes. These necessarily offer regenerative braking, which is great on the open road - helping the vehicle to slow without needing to touch the pedal – but do seem rather sensitive and snatchy for urban use. All in all, though, this is the best hybrid drivetrain I’ve experienced, and not just in any Toyota. Refinement aside, there’s a fair degree of pull, it operates particularly well with this CVT and, even after hoofing it (for the benefit of ensuring a fully comprehensive test), the fuel burn remained pretty good, with an average 4.6L/100km. So would I buy it? No. But can I buy into what it does? Yes. And it’s a positive view, too, about the quality of this generation Camry. It’s a Toyota C-car with an A-rating. WERE you one of those kids who copped school reports that suggested stuff along the lines of “friendly and gets on well with classmates, does his best but needs to try a bit harder”? In that case you’ll know what’s coming next. There’s no doubt that the Niro is an efficient and intriguing car and, even though its designation as a sports utility is basically no more than a marketing convenience – given it has none of the attributes, beyond a blocky shape, that attach to that descriptive – this at least allows it to be considered as an option in the hottest market zone. At the same token, in my opinion, it’s not a top student in this class. Should you put this model into comparison with simply the Ioniq with which it shares its drivetrain, I’d wager that it would be the Hyundai hatch that would generate more positive vibes in respect to design and greater sense of premium-ness. 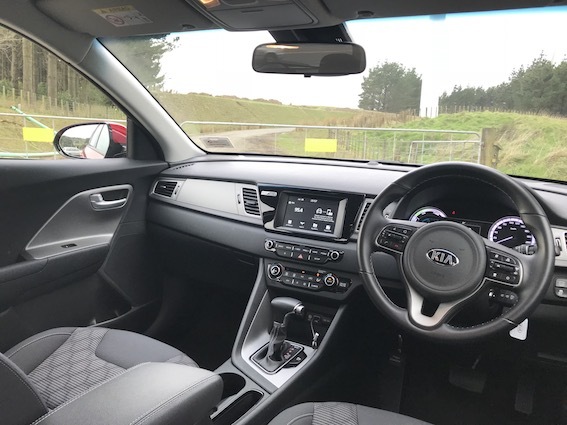 Perhaps that is why the Kia has a stronger value pitch, coming in at a lower price point – comfortably at full retail ($39,990 versus $46,990) and even more substantially with the $34,990 special sticker furnished at initial release to get sales rolling. Is it churlish to suggest one factor that lets the Kia down is that it goes stronger on function than it does flair? You could say that comes with the price and the base EX designation. Y et there are other cars around in this spending zone – the entry level Holden Astra being a very good example - that deliver much more in respect to cabin design and presentation, dynamic aptitude and feel-good character. It’s a pity the Kia does not shine more brightly, there, because the general concept of an economical hybrid petrol car wrapped up in a trending body is patently a good one. So, too, is the drivetrain. Hyundai’s 1.6-litre petrol engine, in marriage to a six-speed dual-clutch automatic transmission and an electric motor, which is fed juice from a lithium-ion battery is a landmark achievement. The engine makes 104kW/147Nm and the electric side complements with 32kW/170Nm to generate (sorry, couldn’t help it) reasonably nippy step-off (0-100kmh in 11.5 seconds) and solid open road performance and, of course, lends the prospect of particularly good CO2 emissions (just 88g/km) and an official fuel economy figure of 3.8 litre per 100km, which is right on par with a Toyota Prius and better than even a small diesel car. Niro (and Ioniq, of course) steps away from the norm in eschewing the usual-choice CVT for a proper six-speed gearbox. This results from the powertrain using a Transmission Mounted Electronic Device (TMED) that allows both petrol and battery power to drive the wheels together. To get to know this side means first acquainting with the car itself. Kerbside presentation is tidy but not captivating; the interior, sad to say, is very much less exciting: While generally looking well screwed together, there’s too much grey, clearly budget plastic. There’s also an abiding sense that, even though it is fresh from the designer’s drawing board, it nonetheless utilises a lot of time-worn elements. Delivering an on-trend functionality of Apple CarPlay and Android Auto, the seven-inch touchscreen nonetheless conspires to be dated in appearance and operability. The spec also delivers cruise control and climate control air conditioning, plus some handy safety assists in the form of autonomous braking, rear parking camera/sensors, lane-keep assist and a tyre pressure monitor. In terms of comfort, the front seats are a little bit on the flat side, and could do with more support for longer journeys, but there's good space in the rear seats and a 401-litre boot out the back. As with the Toyota, the designers have found a way to slot the battery under the seat, this time the rear bench. Actually, the 45-litre fuel tank and 33kg lithium-ion power pack fit side-by-side. The driving lacks in panache. It doesn’t need to be that way – as it has progressed through its generational changes, the Toyota Prius has slowly become more involving, to the point where it’s quite unfair to call it whiteware. Regrettably, though, the Niro would struggle to avoid being so-described. It certainly seems to assume that anyone driving a hybrid has no interest in steering feel or chassis response. This won’t raise if you drive exclusively at low speeds and in town. But is that how average Kiwi driving habits work out beyond our largest cities? Take it up to open road speed and start hitting secondary routes and it is not brilliant, in large because it imbues impression of being quite disconnected, but also due to significant road roar and grip that tends to diminish on anything less than dry seal. Even if you don't think that a hybrid should be especially fun, there's no argument that says it should be quite like this. Which is a shame. The potential for impressive fuel economy on long journeys should be a very good reason for buy-in. But when so much else is as alluring as a weekend in Woodville, the potential for this car raising up as an alternate to diesel is likely to be slim. The Niro is not without innovation: For instance, where many hybrids – the Prius included - have a conventional heavy lead-acid 12-volt battery in addition to the main drive battery, the Niro uses the lithium-ion unit for all electrical functions. It also showcases a Coasting Guide, which saves fuel by coaching the driver with twee yet genuinely useful instruction on how to effect best saving. In markets where it has an on-board sat nav that allows it, the model features Predictive Energy Control that uses mapping information to make the best use of the various drivetrain modes. Overall, though, it’s a car with a report card that suggests a bit more study would take it a lot further.